Spring is the perfect time to cook over an open fire. I got Nathan a fire pit for Christmas and we have used it a few times since then. I also have fond childhood memories of going to the beach at sunset with my family and eating a meal over a camp fire. It’s an entertaining activity to do outdoors with the family. But please take all precautionary measures when building and being around fire, especially with little children. Also check to make sure it is a safe time to have open fires outdoors. Some areas may be too dry to have open flames. All you need for these meals are fire for coals and roasting sticks. Starburst. My mother-in-law introduced me to this on their recent visit with us. Roast the Starburst so it gets soft and gooey. It will bubble up a bit. If you want a sugar high, try it with a marshmallow (pictured above). It’s quite mouthwatering. S’mores. Need I say more? 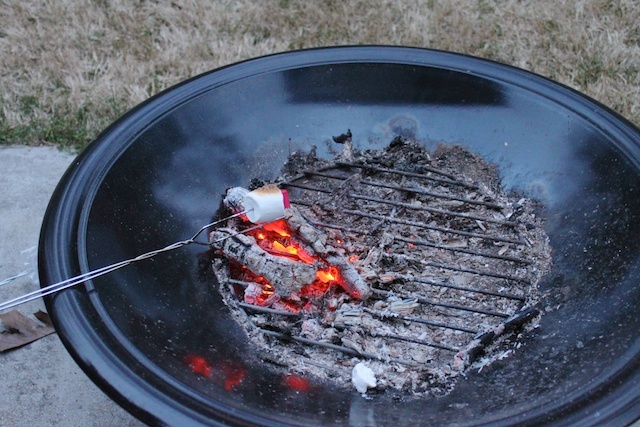 Graham crackers, Hershey’s chocolate bars and roasted marshmallows. That’s all there is to it. Hot dogs. This is a classic. Almost as classic as marshmallows. I think hot dogs tastes best when cooked over open fire. Breakfast in a bag. This is one of my favorite. Bacon, eggs and cheese biscuit cooked in a small (lunch bag size) brown paper bag. Inside the bag, you cover the entire bottom with greasy bacon. The grease prevents the bag from torching up in flames. On top of the bacon you place two small size Pillsbury biscuits from a can. Then scramble a couple of eggs in a bowl and pour the raw eggs over the biscuits and bacon. Close the bag by folding down 3-4 times. Use a roasting stick with two prongs and poke the prongs through the bag at the fold at the top. Roast over a good amount of hot coal for about 20 minutes. Check to make sure the biscuits and eggs are thoroughly cooked before sprinkling with cheese and eating straight out of the bag. Foil dinners. Cube meat (hamburger, steak, chicken, etc.) and vegetables (potatoes, carrots, celery, peppers, etc.). Sprinkle with some seasoning. Drizzle some olive oil or add a few cubed butter on top. All wrapped tightly and in a couple of layers of tinfoil. Toss in the coals. Turn every 10-15 minutes. Make sure the meat is done before eating. Seasoned baked potatoes. Sliced potatoes into thick slices. Place sliced onions between each potato slice. Add a little bit of oil or butter. Sprinkle with seasoning. Wrap it in a couple of layers of foil. Then toss it in coals. Check in 30-40 minutes. Shish kabob. This is whatever you like on a stick. Shrimp, pineapple, apple, peppers, onion, steak, chicken. I like to toss all my shish kabob ingredients in a little bit of olive oil, lemon juice and curry mixture for seasoning before mounting them on the stick. Fish. Salmon is a great fish to cook over open fire. Season and cover with foil. Cook it, but check it often. It doesn’t take long for the fish to cook. » Tell me… Do you have a favorite meal to cook or roast at a campfire? Do you have fond memories of cooking food outdoors? Breakfast in a bag, get in my life!! Yum, I can’t wait to try that!! Is the bacon raw or pre-cooked? that would be raw bacon. breakfast in a bag is delicious. you’ll love it. Oh, man. I love this! We wouldn’t have dated in high school either; I dated husband’s brother for a year! I made the breakfast in a bag and it was a hit. Everyone was so impressed and could not stop raving about it. For Breakfast in a bag: when you say biscuits out of the can, do you mean the uncooked type? yes, like the pillsbury biscuits, small size though.